At 5’2”, Grandma was a pleasantly plump woman with a round face and full lips. She had a light olive complexion, wore reading glasses that sat on a nose “too fat” she often complained. Her soft, wrinkled skin smelled like Jean Naté. My grandma’s name was Ana, born in 1898, the second of six siblings. She worked as a secretary for a steamship company, typing and transcribing in Gregg’s Shorthand. She was soft-spoken, a temperate woman. I witnessed her faith in action. Seeing her on her knees by the bedside in prayer was the norm. She expressed love and devotion by being a “doer of the Word and not a hearer only,” forever willing to help others. Even during the times when I’d see her wincing from the pain in her knees and feet, she’d still stand over the stove, making treats to hand out, or write cards and letters to encourage others. Grandma suffered from arthritis and blamed the tight pointy shoes she wore in her earlier years for causing her painful feet. All her current shoes in black were odd looking and clunky like the ones worn a long, long time ago. I enjoyed playing in them as a youngster. Clip-clop. Clip-clop. Grandma’s shoes echoed as I walked in them across the tile floor. With one eye shut, I squinted, concentrating on the task of getting the string into that tiny hole. Grandma wanted me to learn how to sew, but I preferred sitting on the floor, playing with her sewing stuff instead. I either sifted through the mason jars she kept filled with buttons of all sizes, or rummaged through her large round tin can packed with spools of colorful threads. Inside also were porcelain thimbles, a pincushion, and even a wood darning egg for sewing Grandpa’s socks. The click-clacking of her sewing machine in the afternoons were soothing to my ears. Listening to her humming to His Eyes Are on the Sparrow, whether she sewed, crocheted, worked in her flowerbed or bathed me always ushered in a warm sense of belonging and well-being for me. On wash days, Grandma ironed all bed sheets, linens, pillowcases, cloth napkins, and even Grandpa’s white hankies. I helped her to fold but knew I didn’t like ironing one bit. “Mary, it’s good that you give me a hand,” Grandma said as she sprinkled water over a napkin before ironing it. “You must learn to do these things yourself one day,” she added. Gonna get me a maid for that, I thought. Overall, I liked helping Grandma with chores. She saved S & H Green Stamps that I enjoyed pasting in a book. She did many things differently than what I saw Mama do with her time. Even when she was busy, Grandma always talked to me. I liked studying her. I thought it funny the way her mouth moved, with her lips still closed, whenever she read. I marveled how her fingers typed fast and hard on the keys to her black manual typewriter, wishing I could type like her. In retrospect, Grandma liked my curious mind and eagerness to learn. When she gave me a small white leather Bible for my own, I felt special. “The Lord is my Shepherd . . .” I began. As promised, when I finished, she gave me a crisp, two-dollar bill. Sometimes I watched Grandma in the kitchen cooking and helped by peeling carrots or potatoes using her peeler. “It’s good that you pay attention, dear,” Grandma said, wiping the chicken grease from her hands on her apron. “Why?” I asked, rubbing my eyes burning from the onions. “Señoritas must know how to cook. And you dun want to become vaga,” she replied in her broken English, throwing everything into a pot, adding milk. My husband gonna have to help cook if he wants to eat, I mused. At my grandparents’ house, I’d run about or played hide-and-seek as much as I wanted. Except maybe when I tried playing an April Fool’s joke. But it so happened to be my grandpa instead. He popped my enthusiasm letting me know it was too early in the morning for such nonsense. He might have popped me on my bottom too, if he hadn’t missed when I shot past him like a dart and hopped back into bed. Years later, after Grandpa’s passing away, Grandma hadn’t a soul to depend on. Yet she never stopped doing good deeds for others. Grandma often spoke with my mama regarding her own illness, insisting she wanted to be at home when it became her time to die and not in a hospital. I prayed that when God took Grandma home, that He would help me to relinquish her. I didn’t want her to suffer anymore but still found it difficult in letting go. I knew I had to, I knew I needed to, but I didn’t know how or if I could. A horrific day for our country. In shock, I watched the Space Shuttle Challenger break apart and burn, seconds into its flight. Five men and two women lost their lives tragically for the good of all humanity. They lived their dream by serving others. I may not have known them personally, but they died as heroes. Three months later, on April 3, 1986, sickness reduced an unsung hero to skin and bones as she lost her bout with cancer. She wasn’t affluent. Refined. Or famous. 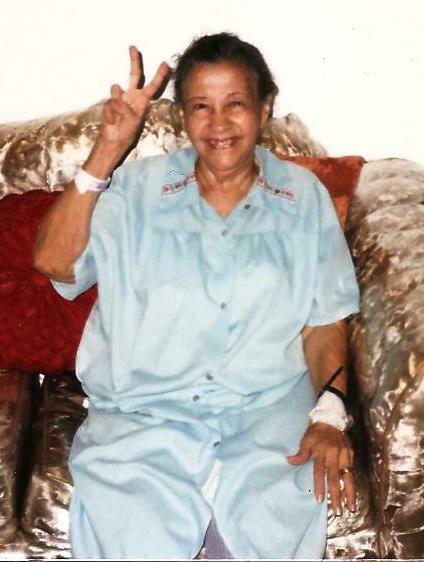 She was an eighty-eight-year-old Puerto Rican woman. My beloved grandma. And my heroine. When Mama called me and told me about Grandma’s final moments, sobs stuck in my throat. She expressed how she had sat by my grandma’s bedside terrified, while listening to her breathing as it came in short, laborious rasps. I pictured that heart-rending moment, imagining Grandma’s gentle countenance and Mama struggling to convey her love. And I thought, Oh Mama, she carried you longer than nine months. My insides ached, knowing that in her heart and prayers, Grandma carried us all. My grief came in waves. Looking back, I know God spared me from becoming hopelessly morbid and consumed with anguish. Grandma wouldn’t have wanted that. Knowing she no longer suffered, I believed her final heartbeat didn’t mean the end but the beginning. I wanted to celebrate her life when I journeyed back to help with her memorial. Once a plump woman, Grandma had lost so much weight in her final days. She had always loved a white Easter dress of mine and requested that we bury her in it. My dress fitted her perfectly then. I also asked that everyone wear white instead of the customary black garments at her funeral. White carnations—Grandma’s favorite—covered her opened casket. I stood, my eyes caressing her still face, now so thin. Vivid images of her life jumped in my thoughts. I saw her on her knees pleading to God to be merciful to her loved ones. I recalled the many prayers of her being grateful for another day. I pictured her lips moving wordlessly when she read her Bible, with her index finger pointing to the sentences across the worn out pages. I could still hear the sound of her soft voice calling my name. I remembered the merriment of her laughter after listening to one of my silly jokes. I couldn’t blink away the hot tears that blinded me. In my mind’s eye, Grandma came to me. Her love, her hugs, her kisses embraced me. We honored her memory and her passing from this life into the next. A gentle breeze blew the heat of day; the sun hid behind the clouds. The scent of rain. As it started to drizzle, my heart comforted. Grandma always considered it a good omen if it rained on the day someone laid to rest. Before long, her coffin lay in a crypt next to her cherished husband, my grandpa. At last, Grandma’s labors had ended. Thank God, she hurt no more. So true, LaTanya! Please feel free to re-blog 🙂 And thanks! Where would some of us be without Grandmas? Goodness, what a powerful tribute to your grandma. “God is calling me now.” Those words would remain forever etched in my memory had anyone ever spoken them to me! You and me both, Jack. My mom needed to be there during my grandma’s last breath for so many reasons. I certainly believe it was God’s plan all along. I know how you miss them, Brother; we both do. There really are no words…. This is the way I felt about my dear Mother. Very beautifully written, Mary Ann. Liz, I appreciate both your feed back and your encouragement. Blessings!